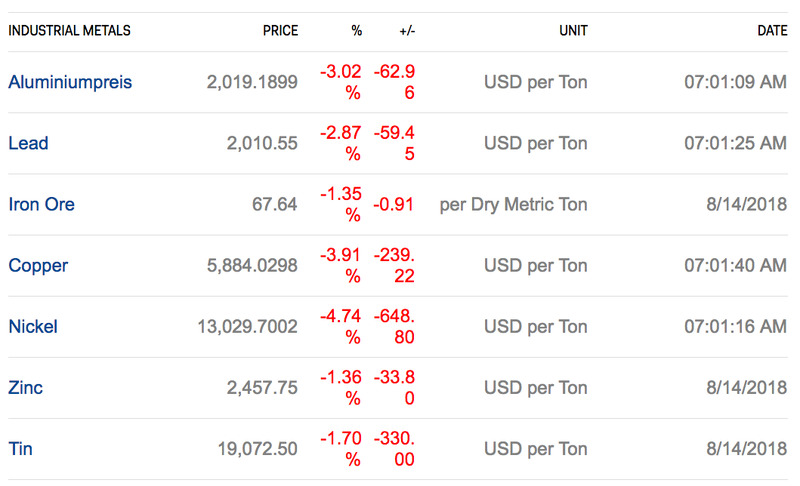 Commodity prices across the board sell off on emerging market crisis contagion fears and a stronger dollar. Industrial metals in particular are suffering, with copper falling to its lowest level in more than a year. Oil is also falling, pushed lower by a combination of contagion and rising inventories. You can track the latest movements at Markets Insider. Commodities across the board are selling off on Wednesday as the emerging market currency crisis continues to wreak havoc in global markets. Metals in particular are suffering as a higher dollar caused by the EM currency sell-off pushes commodity prices sharply lower. Copper is being hit, dropping to a low not seen in over a year. The industrial metal, used in electronics and wiring, is down by close to 4% at 11.50 a.m. BST (6.50 a.m. ET), trading at just $US5,884 per metric tonne, according to Markets Insider data. It has not been below $US6,000 since summer 2017. 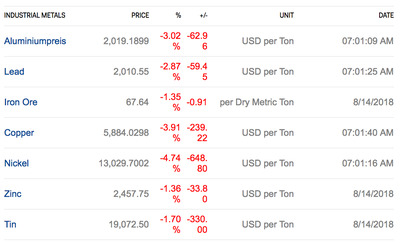 Other metals are also feeling the pain, with aluminium down 3%, lead losing 2.9%, and platinum falling 3.3% on the day. Oil is also having a bad day, dropping thanks to a combination of emerging market woes, and news out of Saudi Arabia that it is considering ending recent increases in production. Prices per barrel for West Texas Intermediate oil are down 0.86% to $US66.06. “There are signs that the dominant OPEC member sees risks of a return to oversupply,” Ken Odeluga, market analyst at City Index said in an email. Odeluga pointed in particular to the recent data on increasing oil stocks in the USA. On Monday, for instance, data from market research firm Genscape showed inventories at the Cushing delivery hub for WTI rose by 1.7 million barrels in the week ending August 10. Commodity prices dislike a strong dollar, and thanks to the growing crisis in Turkey, which risks contagion in other emerging markets, the greenback has rallied sharply in recent days.The Dollar Index, which tracks the dollar against a basket of currencies, has risen close to 2% in the last week, and is trading at its highest level since last June.